The ocean and I have a such a love/hate relationship. Let me be more specific, the PACIFIC Ocean and I have such a love/hate relationship. I remember when I first moved from a little town in Maryland out to sunny Southern California. My impression of this side of the country had almost solely been based on Bayside High and Baywatch. When I moved here, I wanted to drive a yellow convertible right up to lifeguard stand, give David Charvet (if you don’t know who that is, I’m sorry for your eyes) a boyfriend-worthy kiss and bound into the warm blue waters that lapped up onto this beautiful left coast. However, my experience was a bit different. I drove up in a black Mazda Protege (black, lowered, with illegally tinted windows and black rims that I had to buy from a “Your Job Is Your Credit” used car lot), ran across the grey sand into the dark blue water and went into immediate shock. It was about 50 degrees and my entire lower body was wrapped in seaweed and my foot was bleeding from a rogue shell colony. Since that day, I have been in the Pacific exactly 5 times in last 7 years. And once was to save Gidget when she got caught in the current and I found out not all dogs can swim. Moral of this story: Don’t believe everything you see that stars David Hasselhoff. But what, I DO love about the ocean? Eating everything in it. Sometimes I wish I was a shark, so I could just swim around with my mouth open and get free sushi for miles and miles. But, I’m not. 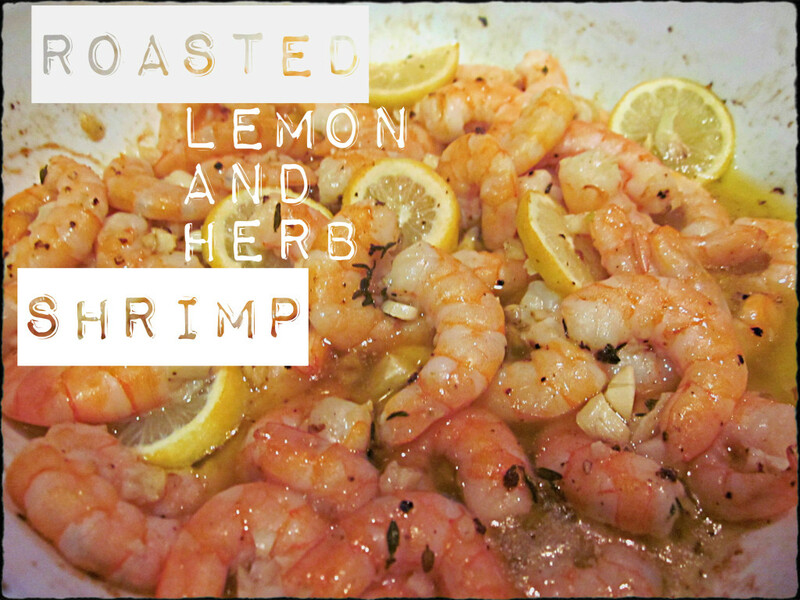 So, tonight we settled for the next best thing – this Roasted Lemon and Garlic Shrimp. It was fantastic and reaffirms my love for the ocean… from afar. In an 8×8 pan combine olive oil, lemon zest and thyme. Meanwhile cook pasta and drain. If you’re subbing roasted broccoli, place in oven at the same time as olive oil mixture. Add shrimp, garlic and thinly sliced lemons. Do Not squeeze lemons.